The best red dot sights for an AK-47 will redefine the way you experience one of the world’s most sought-after platforms. For all its reliability, the AK platform’s substandard stock iron sights limit its effectiveness to medium-range accuracy, at best. Adding the side mount or aftermarket optic gas tube cover needed to ready an AK for an optic takes some personal handiwork – or, failing that, a talented gunsmith – but once you fully realize just how greatly a short-range optic enhances this iconic rifle’s accuracy, you just might consider the proposition a bargain at twice the time investment. Not having a great deal of experience with the AK platform, I took on this triumvirate of promising red-dot sights with great interest and little idea what to expect. With a little research, I narrowed my evaluations to what I consider the four pillars of choosing the best red-dot sights for an AK-47 in particular. Burris FastFire Red-Dot Reflex Sight with Picatinny Mount. Impressions of one red-dot sight’s brightness are virtually guaranteed to vary from one user to the next. To lay out the obvious, that’s because there’s no certainty that any two pair of eyes will function exactly alike. Burris pairing the appreciably crisp sight picture of its precision ground and polished lenses with a light sensor that automatically adjusts the dot’s brightness relative to environmental light was a considerate touch. Unfortunately, they would have done well to also add a user-friendly manual adjustment, as the auto-dimming function can be wildly inconsistent. In some darkened surroundings, it won’t brighten the dot enough. In others, it inexplicably over-brightens the reticle. However, it is usually perfect in bright sunlight. Vortex Optics SF-BR-503 Strikefire II Bright Red Dot Sight with Cantilever Mount. In addition to profound durability, Vortex optics have a penchant for superior all-around brightness. The SF-BR-503 Strikefire II adds an additional anti-reflective coating to the standard multi-coating on its lens just to make sure as much light courses through for optimal illumination. In addition to maxing out light transmission, this sight also delivers a true 1x magnification along with fully adjustable brightness and red dot intensity. 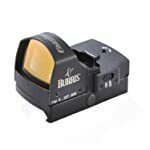 Unlike the Burris, it’s a truly adaptable sight you can tailor to your ideal shooting conditions. Holosun HS403G Paralow Micro Red Dot Sight with T1 Mount/High E/W Turret. As clever as the the automatic brightness adjustment of the Burris was at first and as thoroughly thought-out as I found the Vortex design, the Holosun blew me away with a truly complete package. For starters, the crisp lens clarity and bright, emphatic red dot rivaled the cleanly produced display of the SF-BR-503 Strikefire II. Then there are the nine manually selectable brightness settings, with levels 1-3 being perfect for nighttime shooting and 4-9 performing ideally in daylight, all with the illumination quality unaffected by weather conditions. Everything Burris and Vortex brought to the table, Holosun either equaled or exceeded in this area. Vortex Optics SF-BR-503 Strikefire II Bright Red Dot Sight with Cantilever Mount. Vortex only comes in behind Holosun for admirable construction because both Holosun and Burris have been shown to scoff in the face of water. Otherwise, this is everything shooters have come to expect from Vortex’s fixation on unbreakable aircraft-grade aluminum. Though not quite as water-resistant as its two competitors here, the Strikefire II stands up stubbornly against moisture in its own right. There’s a reason it comes with the vaunted VIP warranty: Vortex has enough confidence in their standard of quality to know it will only be called upon relatively rarely. Holosun HS403G Paralow Micro Red Dot Sight with T1 Mount/High E/W Turret. Holosun matches the FastFire’s overall grit almost note-for-note. Though Burris wins points for demonstrated durability across an extensive array of conditions, the Holosun is its equal for complete waterproofing, being proven submersible to 100 feet. Its high-strength aluminum body can take a kicking itself, but just in case it can’t, the manufacturer offers one of the more sound lifetime warranties of any brand in its class. Burris FastFire Red-Dot Reflex Sight with Picatinny Mount. Without mistakenly knocking Vortex or Holosun, Burris easily impressed me most with its solid construction. Like most laser sights, it’s a small wonder of an optic, low-mounted and weighing in at only 1.6 ounces. Nevertheless, this red dot’s sheer toughness has been tested atop semi-automatic firearms, slug guns, shotguns, and high-powered rifles without flinching. Mercifully, the sensor cover puts the unit to sleep when the dot’s manual switch is “on,” further preserving its astounding five-year battery life. Its phenomenally durable metal and Picatinny mount will suit virtually any rifle, including any AK. Burris FastFire Red-Dot Reflex Sight with Picatinny Mount. To be entirely fair, Burris had an outstanding idea devising a reticle that required little if any attention to its visibility. Who wouldn’t prize a feature that left more focus available to one’s accuracy as opposed to fiddling with switches? Sadly, there’s just no arguing that it was a worthy concept executed poorly…this time. That isn’t to say I won’t look forward to Burris sticking with what could be a promising unique selling point and sanding down its rough edges with a more intuitive sensor. Holosun HS403G Paralow Micro Red Dot Sight with T1 Mount/High E/W Turret. The Holosun is a different story. The world’s most current LED tech allows its dot to light up for around 50,000 hours of use on a single battery. Most impressively, it takes the Burris concept of a “smart” sight and seemingly perfects it. In addition to its manual switch, it can switch on automatically upon sensing movement and shut off after either a default period of time or one personally set prior. While the Auto-Off can be tuned to anywhere from two to 12 hours or left at the default eight-hour timer, there is unfortunately no apparent way to turn off the motion activation except to just shut the whole unit off. Still, that is impressive use of burgeoning technology that may one day further change the way we shoot. Vortex Optics SF-BR-503 Strikefire II Bright Red Dot Sight with Cantilever Mount. In a way, Vortex is a lot like Leupold in terms of the manufacturer’s generally established expectations for sights: there often aren’t a great many “gimmicks” to highlight in the bullet points of their scopes when it comes to how fast you can find a target. Once you sight down through one, however, you realize that superior design, engineering, and calibration paired with exceptional materials produces optics that could shear a bald spot into a flea’s scalp at 500 yards and trim its longest nose hair at 100. This red dot is no different, with its greatest advantage being that its brightness is simply perfect even in fairly bright sunlight. The AK is arguably most at home where targets are acquired swiftly and I was able to take aim shockingly quickly with the crisp, consistent reticle of the Strikefire II. Burris FastFire Red-Dot Reflex Sight with Picatinny Mount. For its several stumbles, I have to give Burris credit for this much: its complicated adjustments are well-worth the trouble. They involve some meticulous work with just about the smallest screwdriver you can find to tighten and loosen its locking screws. That’s because you wouldn’t believe what a massive difference in point-of-aim each small twist will make. That being said, after an hour or so of tweaking, they stayed solidly and stubbornly put. Combine that with low weight that can feel like a blessing after an exhaustive day of competition shooting, and you actually have impeccable overall accuracy. Holosun HS403G Paralow Micro Red Dot Sight with T1 Mount/High E/W Turret. The HS403G eradicates parallax with extreme prejudice. It is, as literally as I can mean this, nonexistent. When the sizable 2 MOA dot is on the target, you know you are on it. Just as markedly conveniently, it also makes a valuable improvement on its predecessor, the HS403A, by shifting its turret adjustment 3mm higher for easier gloved-hand adjustments. Vortex Optics SF-BR-503 Strikefire II Bright Red Dot Sight with Cantilever Mount. Again, for all the added features and novel manufacturing processes and groundbreaking conveniences of the other two, what more can I say about the Strikefire II’s effective simplicity? At 100 yards, it was supremely consistent and accurate through hundreds of rounds of ammunition. It is, most likely, the one and only red-dot sight you may ever need to buy. Vortex proves that simplicity is often king as my chosen best red-dot sight for an AK-47, proving that simplicity often conquers all. I could almost call the Burris over-designed, for all the ideas it tries gamely to implement without any of them really making a big impression with much more than potential alone. Holosun adopted many of the same general concepts of intelligent instant adjustment and, admittedly, trumped Burris by executing them more successfully with their own spin. At the end of the day, though, I just want my AK to have a scope that I know will shoot straight and can absorb a beating without giving up the ghost the first time it drops on a rock. Right eye has renia problem. Makes target hard to see at 100 yards. Can I side mount on ak spitfire 3x red dot?